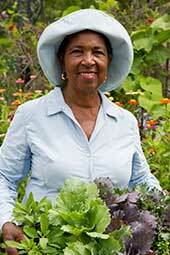 On April 23, 2013, at age 68, Jeanette Bell opened her first teaching garden in the New Orleans area. Located on Mars Place in Gert Town, Jeanette’s “Garden on Mars” was created to provide local residents with the knowledge and hands-on experience to start their own businesses. With support from health leader Kaiser Permanente, Jeanette used her decades of business experience to teach Gert Town residents how to turn unsightly vacant lots into verdant, urban farms producing the healthy fruits, vegetables and flowers so valued by local restaurants. Enthusiastic residents quickly recognized the dual benefit of extra income and a beautified neighborhood and were soon seeking out other lots to develop. Success in hand, Jeanette recently acquired two Ninth Ward lots and is now sharing her knowledge with residents of those neighborhoods. Jeanette developed her insight throughout decades of cultivating the land. From her earliest days in rural Mississippi, she reserved her highest regard for the food she grew at home. Even as an adult, when work required her relocation to congested cities, Jeanette always found pockets of land where she could raise fresh vegetables and fruit. Over time, the skills and techniques she adapted for urban terrain led to an abundance of fresh produce that she sold to local restaurants. Jeanette soon saw this as a win-win-win opportunity for others: grow fresh food for your family and beautify the neighborhood while earning extra income. The system she developed is now a model for inner-city neighborhoods throughout the nation. It doesn’t take years of life experience to understand the degree to which our local communities and neighborhoods can influence our behavior, mood and outlook toward life. But life experience is essential for embracing the power we have gained to effect change, and for recognizing the many ways we can adapt and control our immediate environment to improve our quality of life. Jeanette Bell … Peoples Health Champion.